… Like a spate of memoirists in recent years, Andrew Solomon has known firsthand the cruelties of clinical depression, but he has also traveled the world over to probe the universal aspects of this bleak human condition. 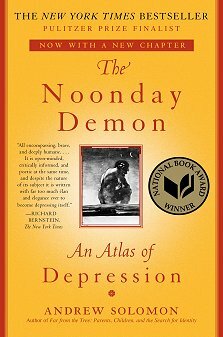 Several years in the making, The Noonday Demon is an ambitious compendium of fact, anecdote, and insight, viewing depression through the prisms of cultural, medical, and political circumstances. Much of what Solomon relays is both heart-rending and fascinating; the book has a scope and passionate intelligence that give it intrigue as well as heft. … Educated at Yale and Cambridge universities, Solomon has published two previous works — a novel and a study of Soviet artists — and his erudite curiosity bestows The Noonday Demon with a particularly generous point of view. He is also, one hastens to add, the son of a pharmaceutical industry executive; this insider position informs his stance but does not define it. A social and political liberal, he believes that the regimen of drugs he takes has saved his life, and that the recent miracles in the field of antidepressants — the SSRIs, or selective serotonin reuptake inhibitors — have given us an arsenal of weaponry against the consequences of depression. But he is no shill for Prozac nation or any magic-bullet phenomenon, nor does he succumb to the other shortcut arguments on the etiology of depression that can so limit our understanding. Instead he examines its history (as old as our ability to describe it); its treatment (from bloodletting to Bedlam to Freud); its occurrence in the aftermath of war or weather or grievous personal loss. … The book is smart and compassionate, its narrator blessed with insight and a charming — probably healing — sense of humor. “I’m sorry, I’ll have to cancel Wednesday,” Solomon, spiraling downward, told friends when they called. “I’m afraid of lamb chops again.” But this, too, as we know from Chaplin and Perelman and other great wits, is one of depression’s multitude of faces, many of them unmasked here with candid grace.